"Everybody has a hustle...whats yours"
Paper Chasin' is based around the main character, Cart Blanche, played by D.L. Clark. Cart Blanche's biggest concern in the world is how he will continue to make money. In order to make money, he engages in a variety of activities whether they are legal or not. Cart Blanche owns various small businesses. He is the main artist of his own music production company. He starts to come up in the Hip Hop world, and his latest mix tape is getting making a big buzz in the Hip Hop community. The reason that Cart Blanche becomes so successful with his music is because he takes care of everything himself. He does not have to pay anyone to manage him, and he also gets the chance to make his own creative decisions. Dell, played by Jason Rivera, is Cart Blanche's right-hand man. He does all of Cart Blanche's dirty work and everyday tasks that Cart Blanche does not have time to take care of. Cart Blanche's world changes when Lauren, played by Lauren Hooper, a record label producer, tries to pursue him. Cart Blanche becomes internally conflicted with the idea of becoming famous on a major record label producer. Cart Blanche's girlfriend, Thalia, played by Piarry Oriol, begins to talk to the FBI about Blanche's ways. They are beginning to suspect him and are trying to make a case against him. As if this is not bad enough, Cart Blanche's old friend, Uglyman, played by J Steven Williams, gets out of jail and tries to persuade Cart Blanche to get back into being a thug. Uglyman creates a conflict for Cart Blanche and comes to fight with Cart Blanche's crew. The fighting then becomes more serious as the story moves along. Even though everything is falling apart in Cart Blanche's life, he has to do his best to keep his position on top. 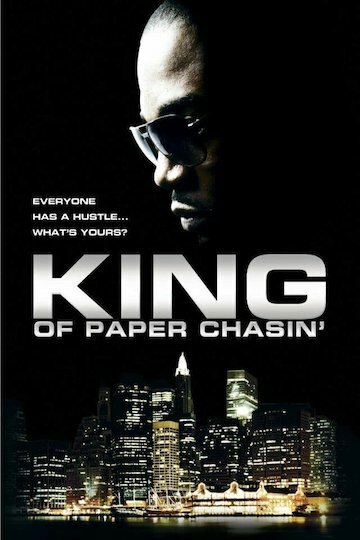 King of Paper Chasin' is currently available to watch and stream, buy on demand at Amazon, Google Play, iTunes, YouTube VOD online.